Thomas the Rhymer or True Thomas is a ballad about the medieval prophet Thomas of Ercildoune. He meets the Queen of Elfland who takes him away from earth for seven years, putting him through various rituals which no doubt instil his prophetic powers. Carl Loewe set this ballad to music as Tom der Reimer (op. 135a, ca. 1860). Ewan MacColl sang Thomas Rhymer in 1956 on his and A.L. Lloyd's Riverside anthology The English and Scottish Popular Ballads (The Child Ballads) Volume I . This and 28 other ballads from this series were reissued in 2009 on MacColl's Topic CD Ballads: Murder·Intrigue·Love·Discord . He also sang Thomas Rymour on his 1961 Folkways album of Child Ballads, The English and Scottish Popular Ballads: Vol. 1 . Thomas of Erceldoune, the 13th Century poet, was author of a long poem describing a visit to Elfland and the supernatural events which took place there. The poem served as a basis for the 15th century romace which, in turn, probably provided the raw material for this ballad. Steeleye Span released their recording of Thomas the Rhymer in 1974 in two different versions: a short one (3.14) with just five verses as a single with the B-Side The Mooncoin Jig and a long version (6.44) on the original Chrysalis UK release of their LP Now We Are Six . However, most reissues of this record contain the shorter single version of Thomas the Rhymer with the exception of the BGO CD reissue. See the notes to Now We Are Six for details. 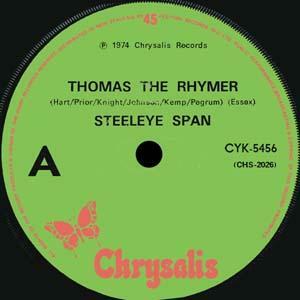 Thomas the Rhymer was also re-released on several compilations, among others on Original Masters (on the LP the long, on the CD reissue the short version), on Spanning the Years (short version) and on A Rare Collection 1972-1996 (long version). and from The Forum, London on September 2, 1995 on their CD The Journey . Steeleye Span recorded this song for a second time for their CD Present to accompany their December 2002 reunion tour. Mary Macmaster sang True Thomas in 1991 on Sileas' cassette File Under Christmas and in 1995 on Clan Alba's eponymous and only CD, Clan Alba . Thomas Rymour apparently lived in Ercildoune in the 13th Century, although the historicity of the journey described in this song is surely open to question. Published in Minstrelsy of the Scottish Border . This version was collated from various sources and Anglicised. Alison McMorland sang Thomas Rhymer in 2010 on her and Geordie McIntyre's CD Where Ravens Reel . Her mantle o' the velvet fyne. “All hail, thou mighty Queen o' Heaven! “Harp and carp along wi' me. “True Thomas, ye maun gang wi' me. She's ta'en True Thomas up behind. Tho' after it but few enquires. Tho' some ca' it the road to heaven. Whatever ye may hear or see. “A guidly gift ye wad gie to me! At fair or tryst where I may be. That lies across the lily leaven? That lies across the ferny brae? 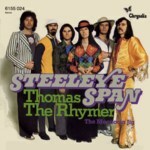 See also the Mudcat Café thread Thomas the Rhymer (NOT Steeleye Span).